Today is Flaunt Your Red Day! I'm sure most of you never heard of it unless you read my blog post on Monday. If you missed it, you can read it here. For some reason, I love the color RED! I enjoy wearing RED. I love RED cars. But I really don't use RED to decorate my home. It's a little too much for me at home because I see my home as my nest ... a place of peace and rest. But let me start flaunting my RED! I hope this photo isn't too risque. I was just showing off my RED lounge wear at Christmas time. My mom always liked RED too. This is her table at Christmas time all set with her china and RED accents. The American Heart Association (which is very near and dear to my heart) has a special program called Go Red For Women. And do you know what their goal is? 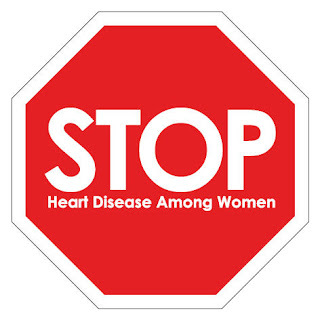 To stamp out heart disease in women! Notice the big RED stop sign? BTW, did you know that heart disease is the leading cause of death in women? I had to get that plug in somehow. After all, it is still ...Fitness Friday. Do you recognize who that is with the lady in RED? Yes, it's Charlie Gibson. He happened to love RED so he asked to be photographed with me! Yeah, right ...I took my niece to Good Morning America and he was kind enough to allow me to be photographed with him. How about these beautiful RED geraniums in my backyard? Only kidding ...they are on the grounds of Phoenix Biltmore Hotel. I really do have RED geraniums in my backyard around my pool but they aren't doing that great right now in the heat. So, I figured these look better than mine. This is me and my honey in Italy! This photo was taken when we were sailing to the Isle of Capri which is such a beautiful location. Notice my RED and white shirt? And my final RED picture is one of my friend Helen and me. We were goofing off at Christmas time and even had a girl's weekend bash. As you can see, Helen has RED hair and she likes RED too! Well, I certainly had fun flaunting my RED today! How about you? You can join in and write a Flaunt Your Red post. Simply link your blog post to our host Nancy's Southern Lady. Or you can check out the other participating blogs. Whoo hoo love the PJ's ;) Love these pictures. Enjoyed reading about all your "red." You look great in RED. Love the pictures of you. After seeing the pics of your house, I wasn't at all surprised when you said those geraniums were in your backyard! ha ha. I love Charlie Gibson! What a thrill it must have been to be photographed with him! Great looking RED photos, The photo of the flowers lining the sidewalk is just gorgeous! Have a great FY Red Friday! Honey, if you've got it, flaunt it! And you've got it! You're quite pretty in red, and Charlie Gibson just pales in comparison! I'm glad you decided to flaunt your red today! You look great in the color and all the flowers were beautiful too! Nice post, enjoyed all of the red. What a great assortment of red clothing! Glad you got to meet Charlie! Debbie, "woman in red" you are gorgeous my dear! From the "other girl in red," good post. I remember our sleep over - what fun to be girlfriends!